Braxton is awesome! He’s so awesome. He’s beyond awesome! He’s bey-awesome! Braxton has been doing some really incredible things lately. I can’t even believe his awesomeness right now! As you know, Braxton has been making great progress walking as long as we hold one of his hands. He is getting much faster and able to maintain his balance much better. Well, on Wednesday, he was off of school so we had his Physical Therapy session here at home. Then, this happened…. Yes! Your eyes did not deceive you. 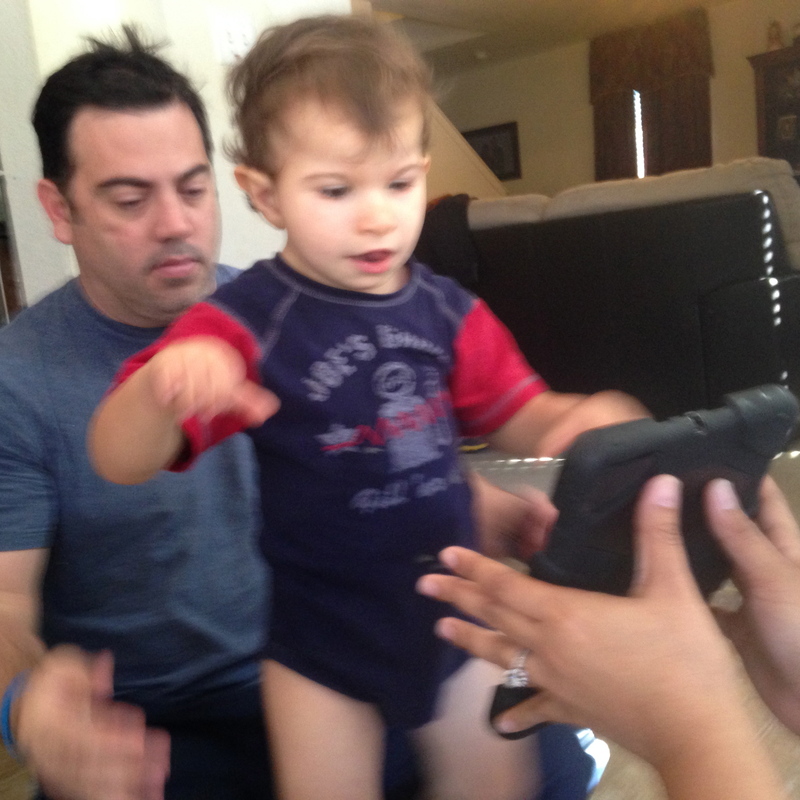 Braxton took his FIRST independent steps in therapy. He took up to 5 steps at a time at least twice and then 2-3 steps each time after. It was pure coincidence at first. I was walking Brax to his therapist when I slowly let go and he kept walking!! We were both surprised and decided to test him and sure enough, another 2 steps. I made Aileen grab my phone and start recording. Braxton took small steps multiple times in therapy. It was so awesome to see and I’m so glad I caught it on video. 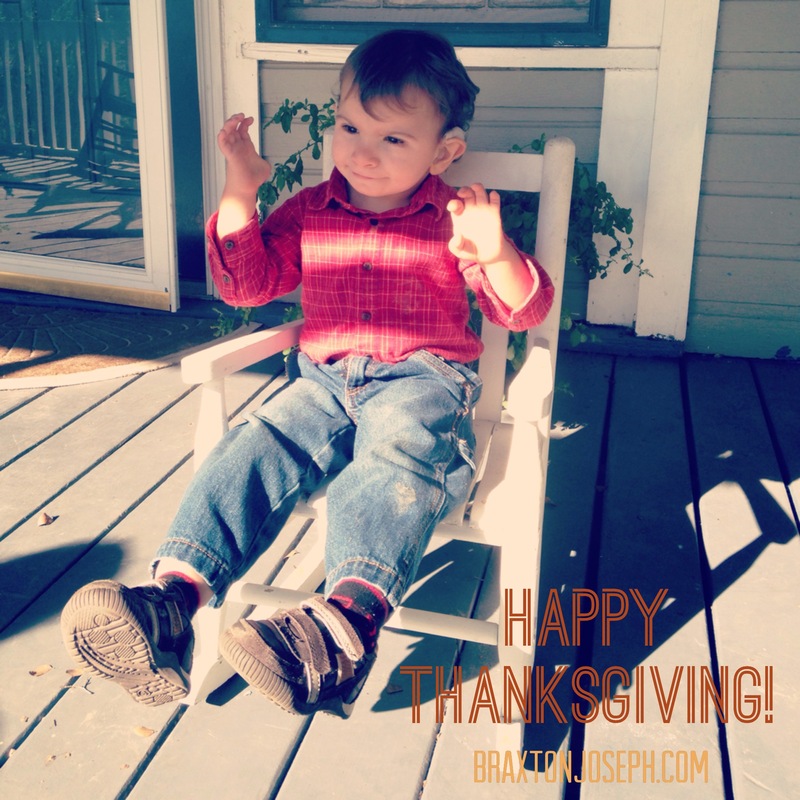 For Thanksgiving, we visited Joseph’s parents and Braxton showed off his walking skills and even took a couple independent steps for his grandparents. He really enjoyed sitting on the front porch in a rocking chair slowly rocking himself in the cool breeze. A year ago he was only starting to crawl, so it was like a totally different child was visiting this time. Braxton enjoyed exploring his grandparent’s house and gave grandma and grandpa lots of love. Friday, we drove back home because Braxton had a Physical Therapy session in the afternoon. He wasted no time showing us he was still working on walking. He took 6-7 independent steps TWICE!! The second time, he might have taken 2-3 more steps, but his therapist ran out of room to back up so Braxton just kneeled when he got to his therapist. Then, Braxton got a little diva-ish and decided he was ‘all done’ with therapy and refused to even stand. Little stinker! His awesomeness did not end there. Tonight, he managed to walk up stairs with me! My back has been killing me all day, and I could barely bend over to pick him up, so we walked over to the stairs. As I started to try to pick him up, he picked up his little leg and placed it on the stair in front of him. In disbelief, I waited to see what he would do next and sure enough, he beared his weight and pulled on my hand to lift himself up. And without prompting, he repeated the action to go up the next step. I know that he isn’t technically ready for stairs and his PT might even discourage it a little, but Braxton definitely understood what he was doing and he honestly only need help to stay upright, and I used my leg as his backboard so he could push up and off of me as needed, but he did all the work. He even reached out to the handrail for balance and to pull himself up! I tried to get him to do it again so I could catch video, but he wasn’t feeling it. Nevertheless, he is making INCREDIBLE progress!! I am sooo excited! Braxton is truly beyond awesome! He’s bey-awesome!! Look out world, here comes Braxton!